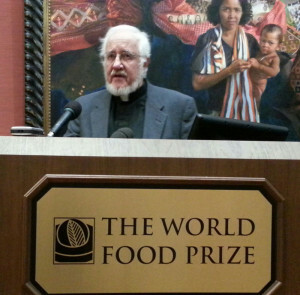 A recently retired Lutheran minister from Ames will be honored at next month’s World Food Prize festivities in Des Moines. World Food Prize president Kenneth Quinn announced today that Reverand Russ Melby will be presented with the Robert D. Ray Iowa SHARES Humanitarian Award on October 13. For 30 years, Melby organized Church World Service Hunger Walks around the state. “They’ve involved almost 500,000 Iowans in his time of leading this and raised over $12 million that goes to fight hunger at home and abroad,” Quinn said. Melby said he was introduced to the challenges of hunger 35 years ago when he was living in South Dakota and was sent to a meeting of faith leaders in Nebraska. “I attended a Bread for the World conference in Blair, Nebraska in 1980 and my life has…well, it has gone beyond any thought I ever had of participating in hunger ministries,” Melby said. Melby moved to Iowa in 1984 and planned to organize food walks in all 99 counties. “As it turned out, we never achieved that goal, but we did have walks in 82 counties throughout those 30 years,” Melby said. Melby also helped launch the Iowa CARES program, which in 1985, raised over $800,000 to feed starving refugees in Ethiopia. The Iowa SHARES award is named for former Iowa Governor Robert Ray who led an effort in 1979 to send food and medicine to refugees from war-torn Cambodia.